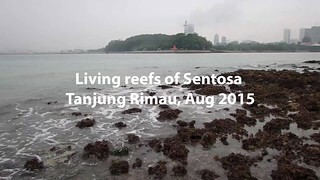 wild shores of singapore: Sentosa Tanjung Rimau still alive! Sentosa Tanjung Rimau still alive! Another rainy morning survey at super low spring tide. 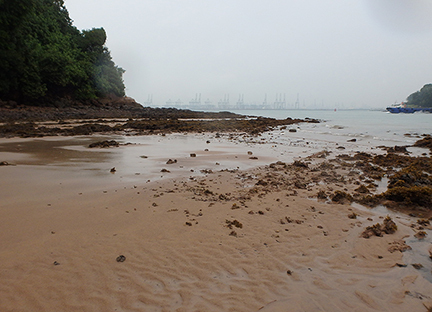 This time, at the natural shores of Sentosa Tanjung Rimau. It was wonderful that Grace and her team from Sentosa Development Corporation took the time and effort to join me! 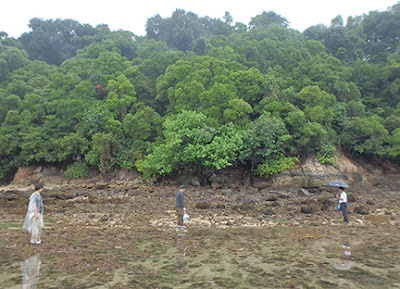 There are seagrasses and corals here! Most of them seem to be doing well with little coral bleaching. David spotted a pair of Coastal horseshoe crabs, the male hanging onto the female. 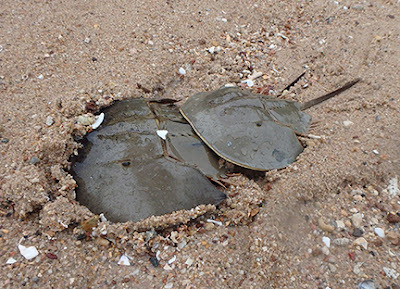 They are now more commonly seen on our northern shores, although we have seen them at Sentosa behind Underwater World, Labrador and Pulau Hantu. 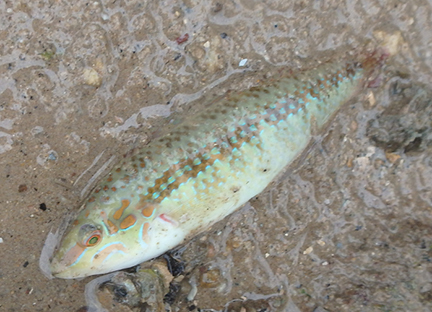 David came across this Diamond tuskfish, which is very much alive although it looks dead. Don't touch it because it can give a nasty nip with its sharp teeth! A gentle nudge with my bootie toes and it's safely in a pool of water without either of us getting hurt. 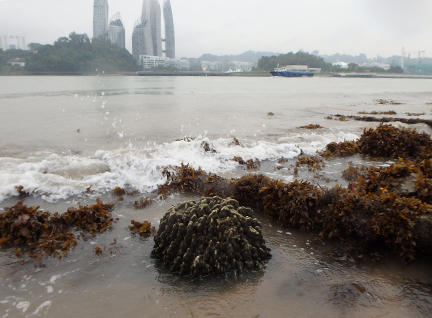 There used to be some large coral colonies near the cable car tower is. 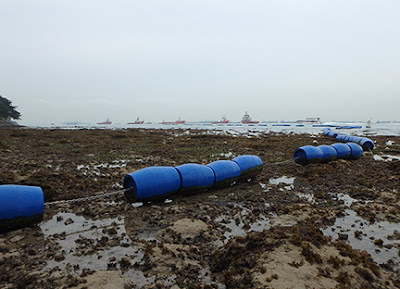 But these were buried in reclamation for Resorts World Sentosa. It was heartbreaking to watch them bury the reef there in Jul 2007. 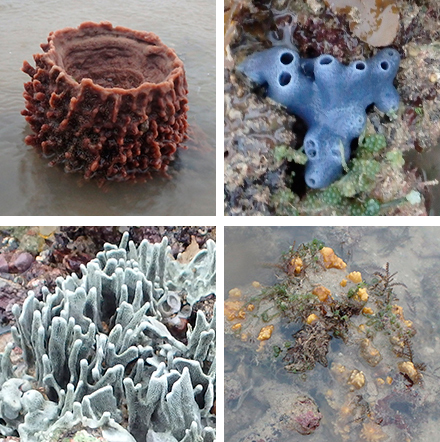 Here's a view of some of the corals near the cable car tower that were lost in that reclamation. So today I was delighted to see many large coral colonies behind Underwater World, peeping out of the water during this very low spring tide. Mostly Boulder pore corals. My last survey here was in Aug 2013 but at a not so low tide. And the trip before that was in May 2011 with Shao Wei when she unfortunately stepped on a stonefish. As usual, I check for coral bleaching. 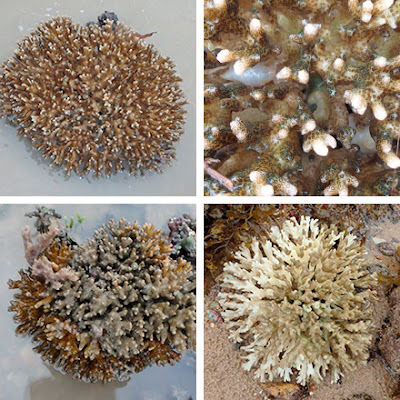 What is coral bleaching and why this is of concern on the Bleach Watch Singapore blog. Fortunately, the latest Bleaching Alert Areas from the NOAA website shows that Singapore now falls outside the 'Watch' status. Let's hope our corals have passed the danger period for the year. 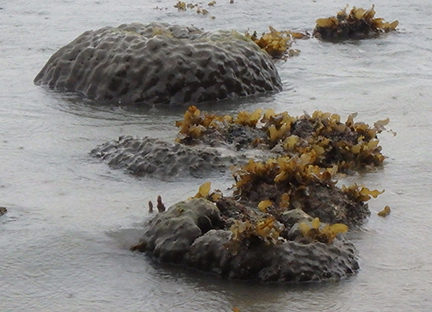 Some of the Boulder pore corals had greyish patches, and one was bleaching. I came across this large colony of Crinkled sandpaper coral and while the top part was pale, most of it looked alright. I saw several Cauliflower corals. About half were alright, and one had squid egg capsules laid in them. Another half were either slightly bleaching, fully bleaching or half dead. There were also many large Flowery disk corals, most of them with pale or with bleaching portions. There were also several small Thin disk corals, most of them alright. David found a nice patch of Branching montipora! Hurray! There was a huge patch of these branching corals behind Underwater World. Here's a photo I took of the patch in Apr 2007. Since the Resorts World Sentosa reclamation in 2007, it has disappeared. Seeing the patch today suggests they may be coming back! I saw a few small colonies of Anemone corals, most of them were pale or odd coloured. As usual, the most abundant coral were Favid corals. Most of them looked alright although some had pale or bleaching portions. 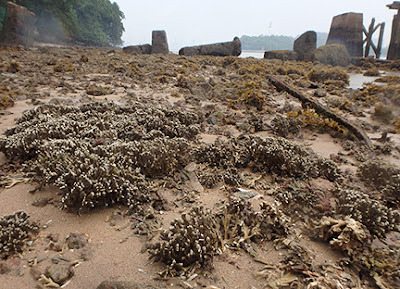 I saw these corals which I seldom encounter on this Sentosa shore: a large colony of Boulder horn coral and a small patch of Lettuce coral. I was glad to see some colonies of encrusting Plate montipora corals. 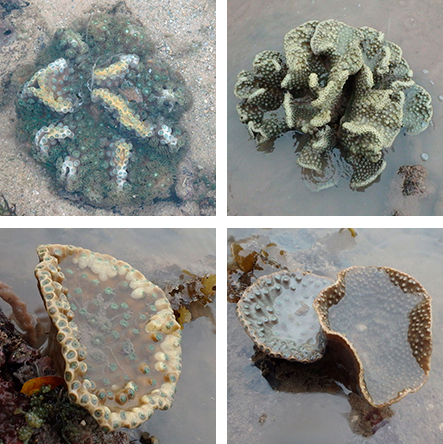 There was a small area of shore where there were many Flowery soft corals. 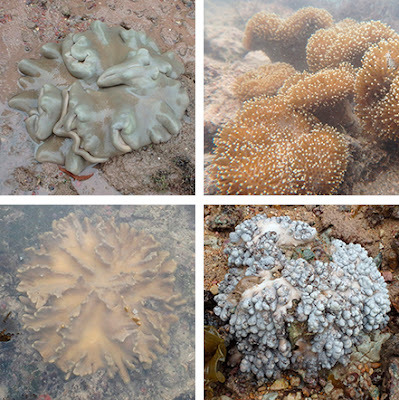 We saw small colonies of various kinds of Leathery soft corals. None of them were bleaching, although some were in very small clumps. We often see Leathery soft corals splitting up into smaller clumps when they are stressed. There were many Frilly sea anemones near the beacon, and many Giant carpet anemones on the rocky shores behind Underwater World. I didn't check the sandy shore for Haddon's carpet anemones. Among the interesting sponges we saw were several small Barrel sponges, small clumps of Blue jorunna sponges, clumps of blue Blue spatula sponge, also clusters of Yellow volcano sponge. There were many other sponges too. I started the survey at the seawall near Resorts World Sentosa. 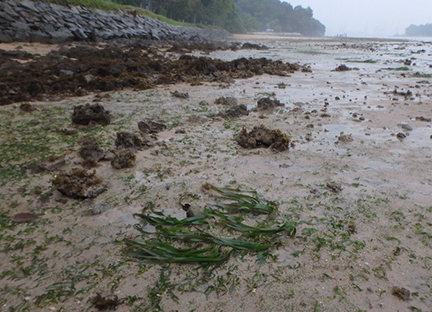 There are still patches of Sickle seagrass. Also a sprinkling of Spoon seagrasses and many patches of Tape seagrasses with long leaf blades. We saw one Tape seagrass clump with many male flowers, and another with a female flower developing into a fruit. 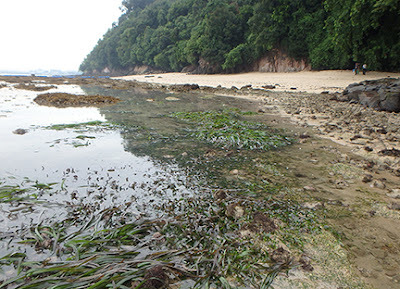 The seagrasses near Rasa Sentosa are still doing well. 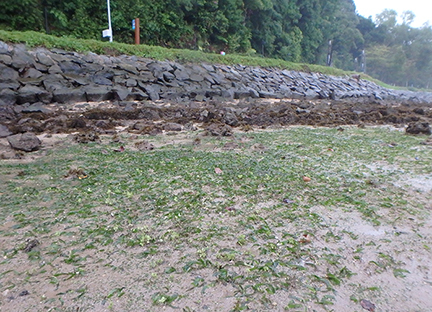 Lots of Tape seagrass with long leaf blades, a nice small lush patch of Sickle seagrass and much Spoon seagrass. David is a plant expert! So nice to know that Sentosa's rare and precious naturally growing rare native plants are in his good hands. We look at the grandmother Nyireh laut and her daughter. They are both well. The coastal forest nearby is draped with Raffles pitcher plants. We had a look at the Delek air and David tells me there is a Pelir musang here too! The rocky area near the beacon is now very sandy. Where did the sand come from? 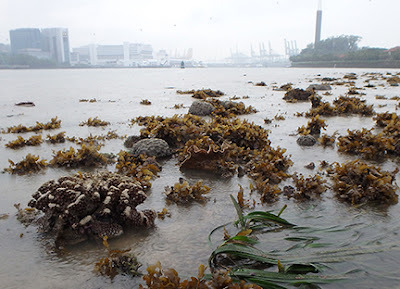 From the massive reclamation for the new Pasir Panjang Container Terminal? We couldn't find any sand dollars that we used to find here. 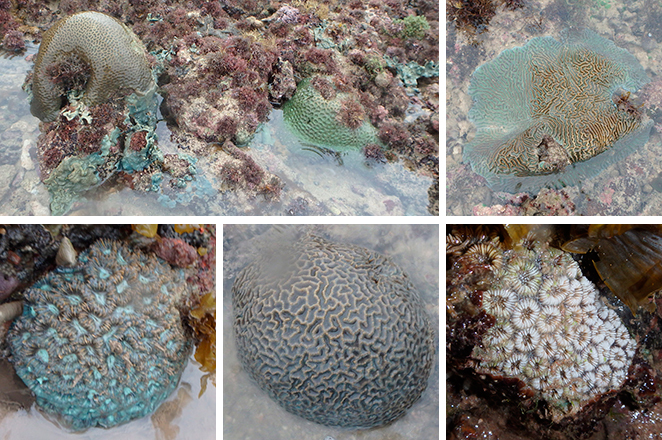 Most of the corals along the reef edge are boulder shaped, or sturdy plates or encrusting shapes. Probably because of the relentless wake from passing ships. Today, the water is brown, probably due to runoff from the rain. The massive line of blue drums remain on the shore. 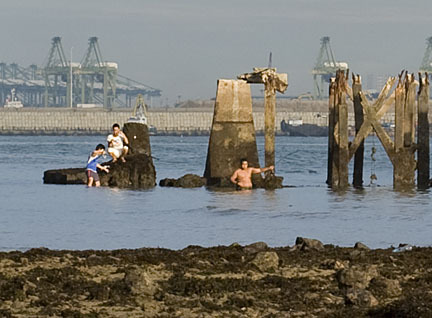 They are part of a floating 'security barrier' installed in 2012. The drums appear to be well anchored and none of the blue drums are broken or leaking. Heng Pei Yan saw broken drums when she last checked in Aug 2013. When we began our trip, on the high shore, I saw a fish trap, and about 6 large peacocks foraging on the shore. This shore is impacted by people who fish from the rocks and reef edge. 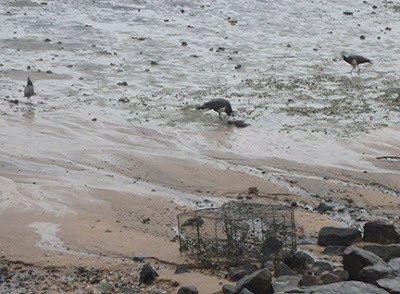 We came across abandoned fishing lines, and these people also trample delicate marine life. Here's some people I observed on my trip here in Aug 2013. People fishing on Sentosa, Aug 2013. Thanks to Grace, David, Gabriel and Sarah for bravely coming for this very wet and rainy trip. And thank you for the lovely breakfast afterwards. Here's a video clip of our little adventure this morning. I look foward to working with Sentosa on their new Nature Gallery which will feature Sentosa's marine life. I'll also be giving a public talk in conjuction with this effort. More details later!